Miss Scotty ... Your mom, dad and sisters Adelyn and Eloise would like to thank you for all the walks, hugs, laughs, car rides, kisses, tail wags, barks, squeaky penguins, pets, licks and, most of all, love that you gave to our home. We will forever cherish the memories we have of you, not just as our dog, but a member of our family. We love you girl and miss you dearly! We adopted Bones in June of 2006. 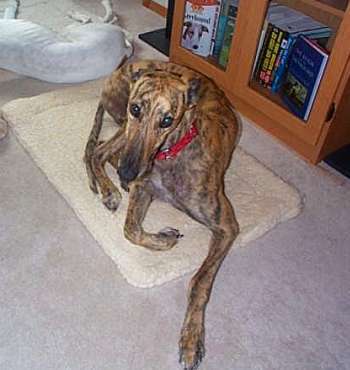 Our dear Bonesy has been much loved and the center of our lives for so many years. Albert was my first dog, and he changed my life in so many ways. 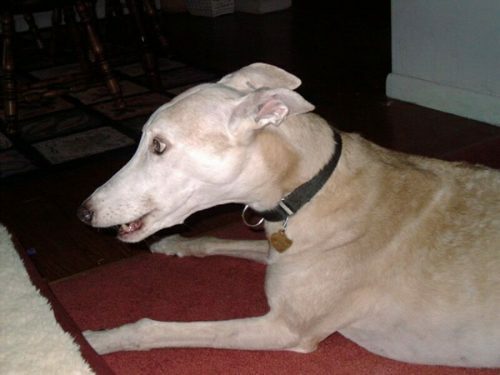 Frodo Devine (Longshot) May 1999 - June 2nd, 2012 - was a beloved part of our family. His loving personalty graced our home for almost ten years. 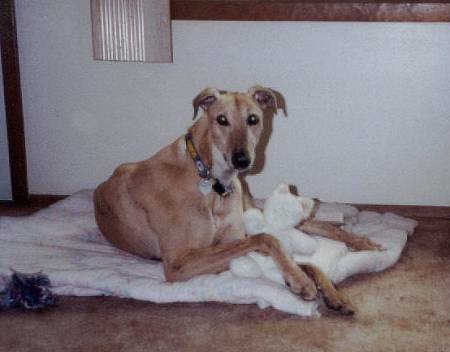 In his younger years, he loved to chase his fav ball, carry around his toys, play with his fellow greys and lean on us for loving. Rest well big boy, we love you always. Lori and Rob Devine. 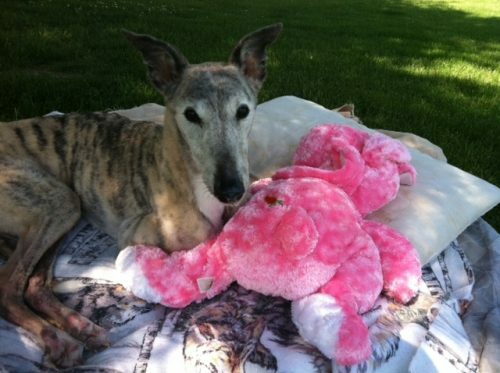 (The picture attached is Frodo with his favorite toy, a giant pink bunny). 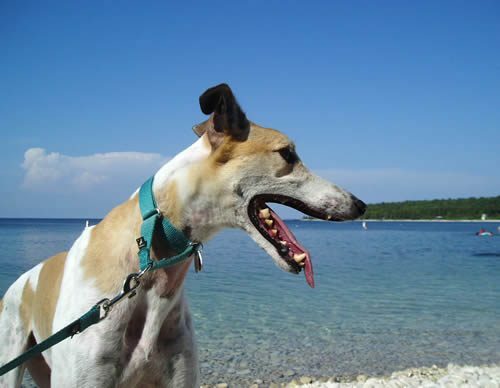 Neon was our big, white, honest, long tongued, teeth-chattering, bouncing, digging boy. He completed our pack as our first "second" dog. Once we figured Neon out he was so worthwhile. Though it could not take away his enthusiasm, the tumor on his spine was the only thing that slowed him down. Neon taught us to live in the moment. We could not ask for more than the privilege of being his companions. On Monday, November 24, 2008 my lovely Dahalia was put to rest. She had a tumor on her spinal cord that was making her unable to walk or go to the bathroom. If you saw her from just her rib cage up, you would have thought she was a happy, healthy dog but then you saw her backend, no muscles, just limp. Thankfully, I was able to be with her and hold her while she passed away. I was able to whisper in her ear how much I loved her and how much I was going to miss her. I was able to comfort her, actually, I think she was comforting me... resting her head on my shoulder, looking me in the eyes with her beautiful brown eyes. I held on to her until I knew she was gone. Then gave her one last kiss goodbye. I picked up her ashes yesterday and it was like watching her leave me all over again. The realization that she was gone for good hit me at that moment. Knowing I would never feel that paw slapping me across the face. (That was her way of telling you she loved you. You would ask her for love and she would pick up her paw and smack you with it, with a big smile on her face. Boy could she smile. If you didn't know better it was kinda scary but I knew it was a smile.) Dahalia was a blessing to us. We loved her from the moment we met. I remember that day like it was yesterday. We drove down to meet her at her foster family. They loved her so much and we could see why. She just drew you in. Well they asked us what we thought and my husband, John said, "We want her". They asked when we were able to come back to get her and he said that he's not leaving without her. We waited around until the family all got home so they could say their tearful good-byes. I felt kind of bad taking her cause I could see how much they loved her but was greatful that she was coming home with me. Then two years ago this Christmas, Dahalia and her brother Willow got out of our gate. Thankfully, we got her back after weeks of searching thanks to all the wonderful help from all the volunteers from the GPA, I will never be able to thank you all for the help. (We weren't as lucky, with Willow. He did come home to us but not how we had hoped.) So that last two years, we got to just love her and be with her thankfully. She will be in my heart now and forever and will be missed greatly by her human family. Dahalia - I hope you are running free and happy with Willow somewhere. I love you!! 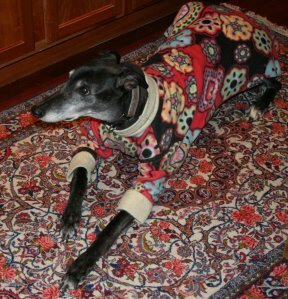 Sam was our heart/soul dog. We understood each other perfectly. 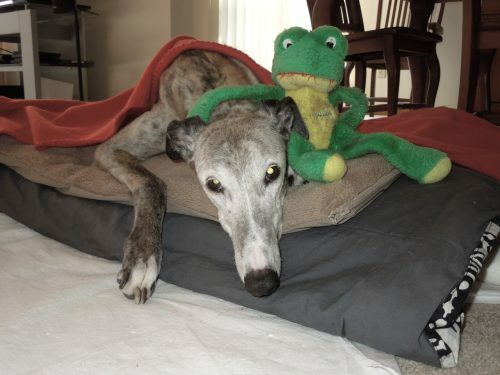 Hemangiosarcoma took him way too soon. We are grateful for everything he did for us and miss our beautiful boy every day. Cohen was our first boy, so sweet and loving. We weren't his first family but we were his forever family. 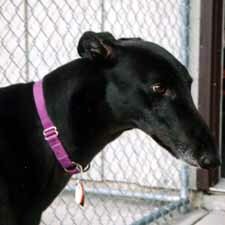 Cohen loved people and would seek out a free hand to pet him for as long as they wanted. 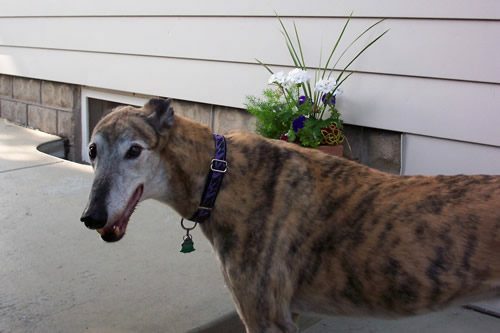 He was a true gentleman, always letting his greyhound sisters get the first attention. 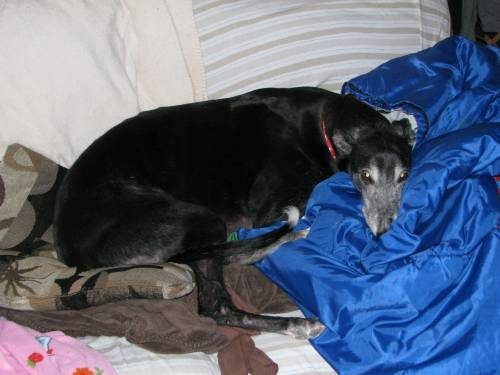 Cohen took his retirement very seriously and spent much of his time on the couch. At the "fun runs" he would just hang out with the people watching the other hounds run. Cohen was his Daddy’s heart dog. He will be forever loved and sadly missed by the Allen family and all who had the pleasure of meeting this gentle soul. Mr. 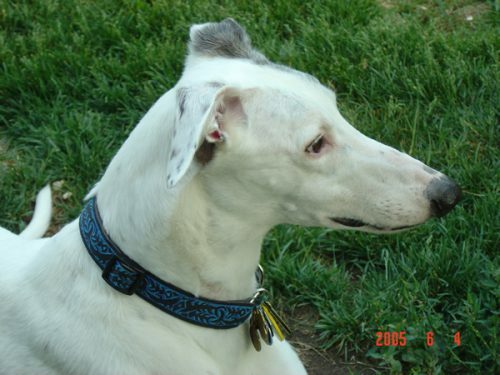 Spirit would have been 13 years old in March of 2006. He was a true friend who was by my side during recovery from 3 serious surgeries in the past 2 years. He never complained even though age was creeping up on him and as well as the disease which took him yesterday (1-15-06) at For Pet's Sake Animal Hospital the site I adopted him from from Dr. McCracken almost 10 years ago. I loved him. He was best friends to my two Tabby felines (both 14) "Boris" and "Luigi." They are also lost without him! 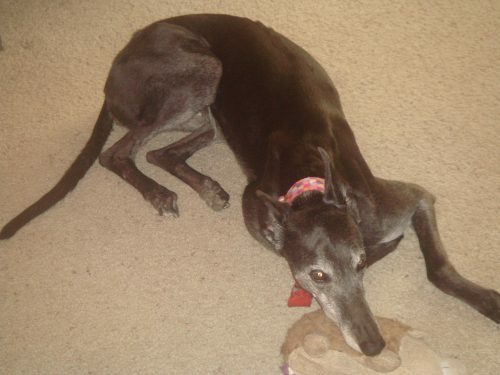 Maggie - our first greyhound - came to us from a previous adoption, so it eased our transition into the world of greyhounds. 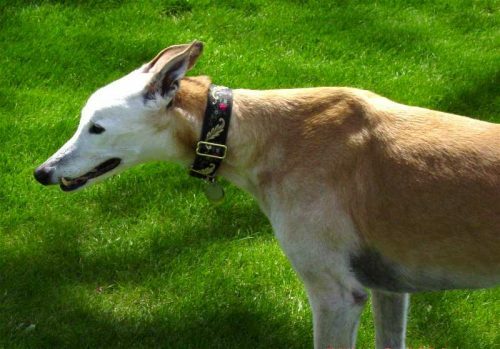 She was a senior dog that really sold us on the greyhound breed. 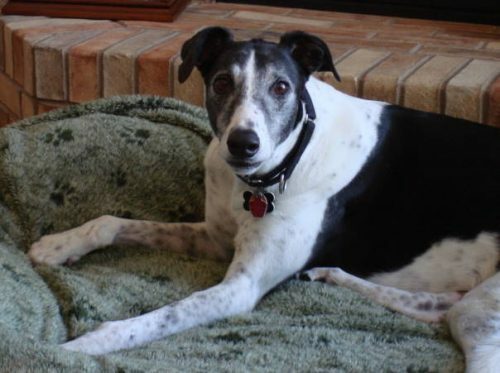 A poorly healed torn ACL and arthritis that was not responsive to the whole array of medications severely impacted her last few years, but she was more loving and more stoic than ever at the end. 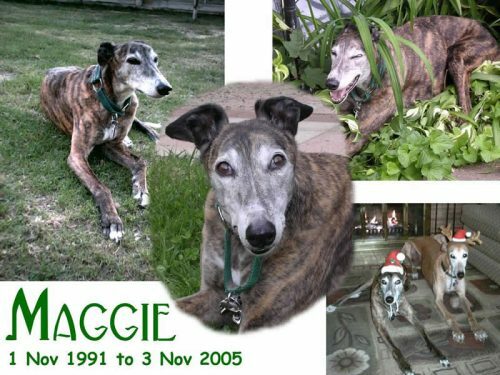 The nearly eight years we were fortunate to have with her will never be forgotten. 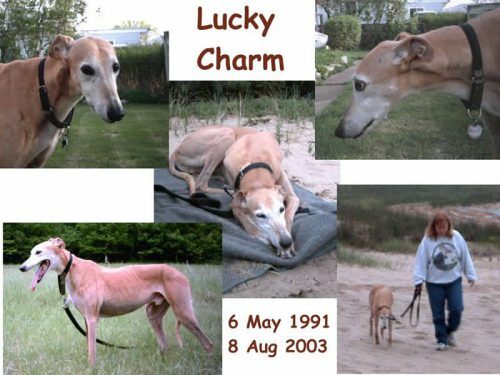 Lucky Charm was also a senior dog when we adopted him - our second greyhound. The big dog (about 85 pounds) was a loving and stubborn galoot. Sadly, we only had him three and a half years before cancer called him over the bridge. You have a special place Dear Lord that I know you'll always keep A special place reserved for dogs when they quietly fall asleep With large and airy kennels and a yard for hiding bones With maybe a little babbling creek that chatters over stones. With wide green fields and flowers for those who never knew about running freely under Your sky of perfect blue. 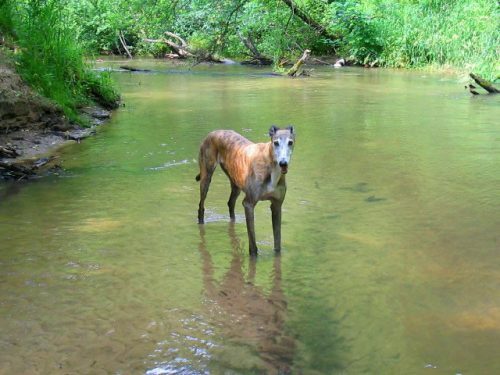 Lord,I know You keep this Special Place And so to you I Pray, For one Special greyhound, Who quietly died today She was full of strength & love and so very, very wise. The puppy look she once had Had long since left her eyes. So, speak to Angelgirl softly please And give her a warm hello. She's a Special gift to you Dear Lord From her mom, dad & Blaze, who loved her so. received her christmas and lost her on christmas, my christmas angel!! 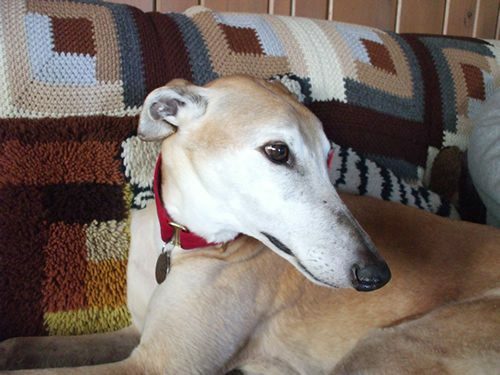 Logan was an exceptionally sweet and gentle dog who was greatly beloved by my family and all who met him. 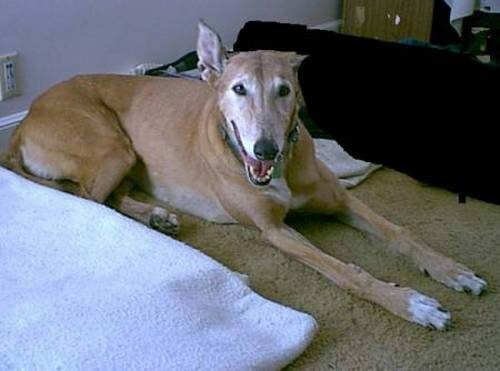 He had an easygoing, laid-back nature, combined with a great sense of fun and playfulness, even as a senior dog. Thank you so much for finding him for us. We will be forever thankful for the joy he brought to our lives. 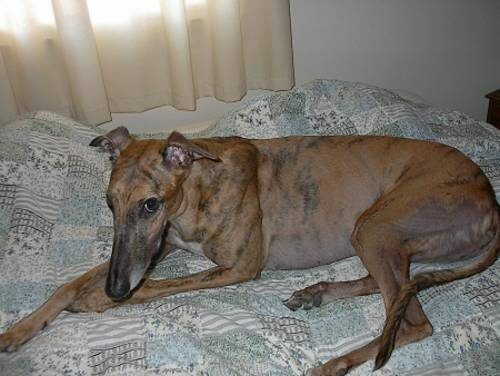 Bashful was our first Greyhound. She introduced us to this wonderful breed. When we met her she was very shy and scared. In time she blossomed into and extremely loving family member. This beautiful senior had us wrapped around her paw and captured our hearts with her big brown eyes. She will be forever loved and missed by the Allen family. Race with the wind, sweet princess. All Things Must Pass Tiger Tim, whose race name was Tim Tide, came to live with us in June of 2000, he was eight. 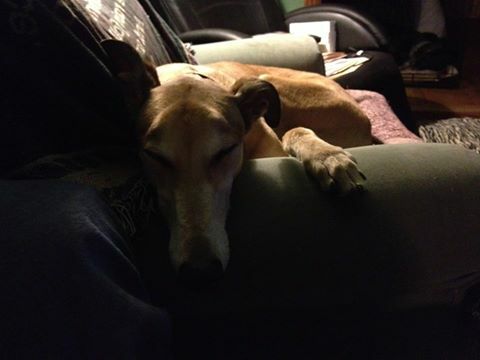 He was a second hand, second hand hound and we loved him. He wiggly-wagged his whole body in greeting when we came home and was always ready for a walk. He loved camping and laying down in lakes. Timmy was an Ambassa-dog (Meet-N-Greets-Southridge Plaza-Milwaukee). My big brindle boy did not like others to know his weaknesses. When there was thunder or fireworks, he would simply retreat to his room. When he was sick, he would hide it. The night he died, he wiggly-wagged around the campfire, enjoyed our company and entertained us all. We could not have known the end was so near. 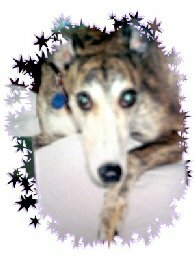 He crossed over the rainbow bridge on labor day morning September 6, 2004. And there he waits for me with all his toes and tail, wiggly-wagging greetings, barking others off the couch and doing the Timmy "Woo" if they try to trim his nails. 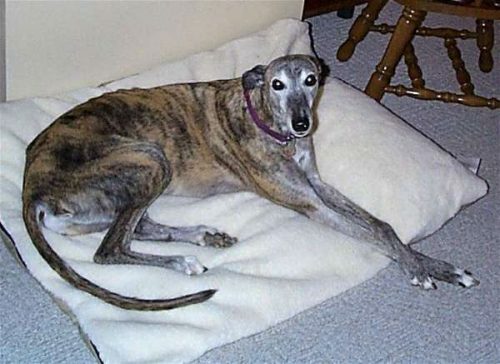 Sabby was my first dog and our first greyhound.She was nine years young on adoption day. The people at the nursing home loved her. We know she is at the bridge, on the couch, eating a steak. The last day she remained happy even though her kidneys weren't. I thank her for teaching me how to be a better dog owner in the three years she had us.The new boys love the initiation of smelling her collar! She will always be part of the Hessen family. 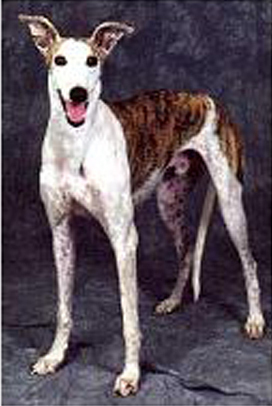 Romp passed away on May 8, 2003 at the age of 8. 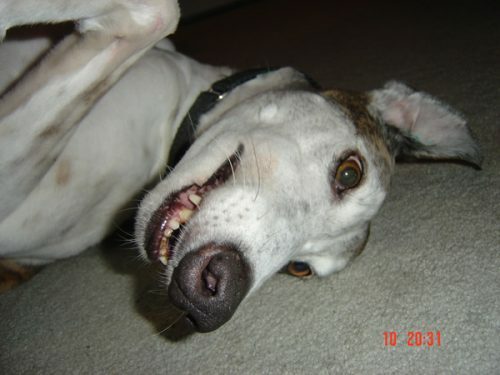 He was our goofy boy who showed us what wonderful, loving animals Greyhounds are. We shall always thank him for this gift. We are currently thinking of adopting a male and a female because of him. We thank Romp, miss him, will always love him, and hope he will watch over our new friends. The Kerl Family. 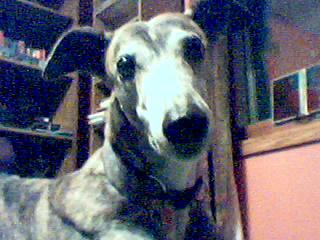 In July of 1999 you wonderful people sent me to Dairyland Greyhound Park where I found Steele. He was the the best companion anyone could ever ask for. I am at a loss for words, but Steele was beyond what I ever expected from a pet. I work out of the home and had the pleasure of spending endless hours with him as he followed me from room to room and sometimes rested his head on my lap for some affection. Steele will also be truly missed by my friends, family, business associates and his new pal Enzo, a little Italian Greyhound puppy I got for him to play with last October. Len Besinger. Bo, even though we only had you a very short year, you became a part of our family from the first day you stepped into our home. You got along so well with your new sisters, Cathy and Shauna. 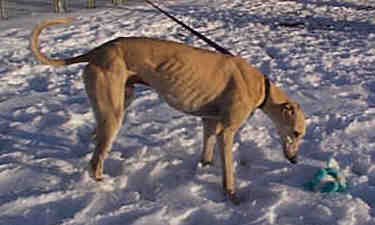 We know you are with Speedy and Odie, running around the fields and enjoying the sunshine. We miss you and will love you forever. Your family, Helen and Jay Wintheiser, Amy Haase. 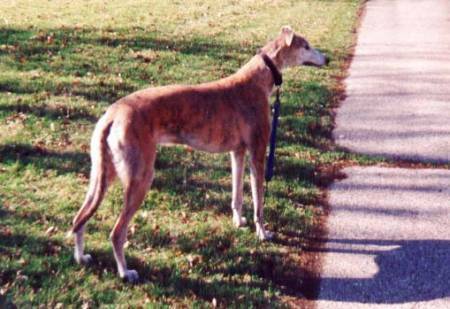 Calvin was our "elder statesman" hound-- very dignified, yet somehow managed to instigate a good game of tag whenever he and the other hounds were outside. Thank you for brightening our lives. Donald Jeske and David Baux. Court, you were a sweet, shy boy who was just coming out of your shell when you were taken from us much too soon. We only knew you a little over a year, but you will be in our hearts forever. We love you and miss you, pal! Nikki and Bob Lien. 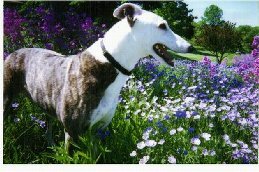 Dash, beloved Greyhound of Teresa and Rick Lemke, who got them hooked on the sweet and loving nature of these gentle dogs. 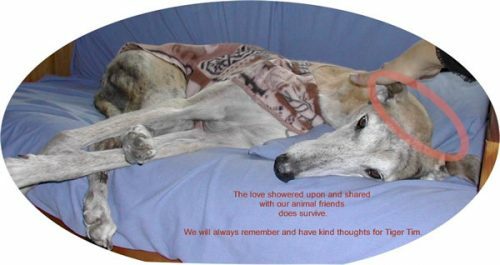 "Run with the wind, Dash"
BDK's Nosey - You are sadly missed - You will always hold a special place in our heart. Rest in peace "Happy Girl". Love, your family, Rick & Brenda Bruyette and Chris & Courtney Vogel. 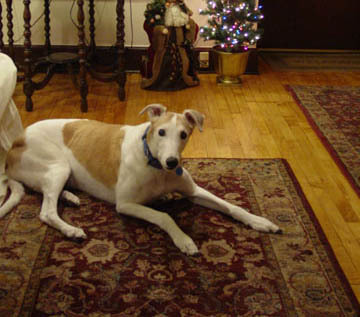 Quincy, beloved greyhound of Donald Jeske and David Baux. 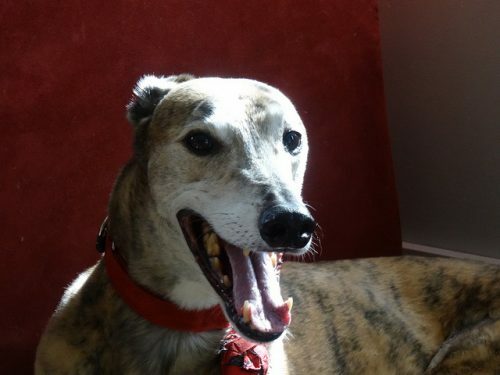 A hound who was full of wonder and somewhat shy, yet was our happy, smiling boy. 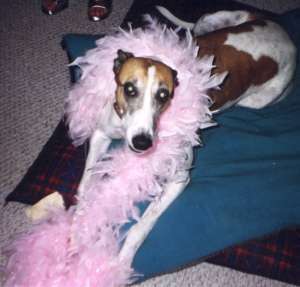 Every day we still remember our dear "Quincer-dog". 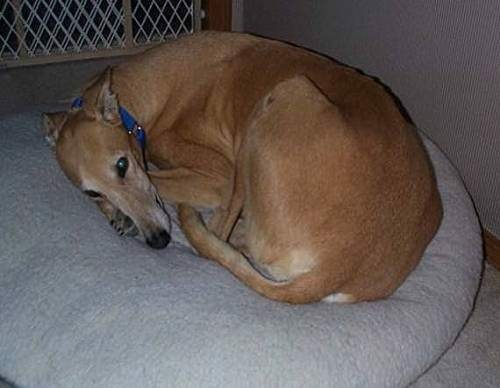 Sir Sonic was a Very Special hound to all the staff of GPA-Wisconsin. 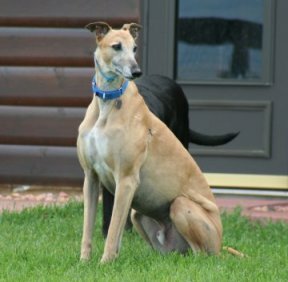 A stately gentleman, Sonic succumbed to a severe respiratory infection before he could be adopted. 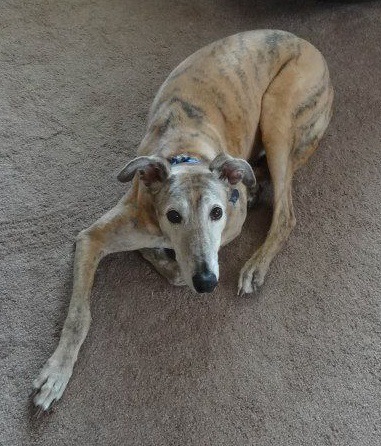 The passing of sweet Sonic, plus the fact that he never had a couch of his own, helped us all re-dedicate ourselves to our goal of placing greyhounds in very special, very loving homes.